What does my blog says about me? I presented two talks on windows azure recently. One among them was focusing on Windows Phone 7 app development. The other one was on MVC3 ASP .Net app. The idea was to introduce how Windows Azure can be leveraged in both these exciting platforms. The talk was demo centric; below are the slides and the demo / webcasts recordings links for the same. 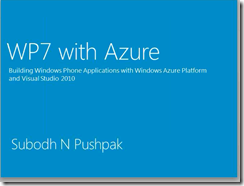 Manage Blobs, Queues and azure table from WP7 ! !